Burrito joints are a dime a dozen. It seems like a new one opens up every month. Chipotle has the market cornered but when you want a great burrito in Nashville jst head to the little place in Berry HIll that has been serving delicious Baja California eats since 1999. I first visited Baja Burrito in ’99 when I stumbled upon it while working in the Berry Hill area one Sunday. They were closed. When I went to the door there was another person who was disappointed and told me how great it was. I made a point to return and was happy I did. Baja Burrito has always been a bit of a dive. Over the years it has become even more so. That’s not taking anything away, I enjoy dives. It can become very crowded during lunch and dinner. Be comfortable with eating close to others, you may be sharing a table during those times. There’s limited parking beside the restaurant but more can be found in lots for the restaurant just behind on Columbine Place. The burritos are generous but I recommend the Peasant Plate. Black and pinto beans are both vegan so take your pick. 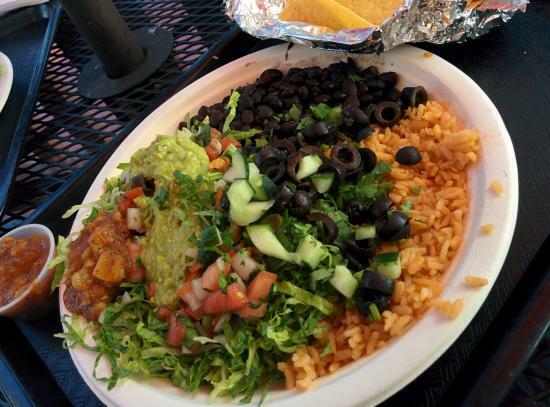 Rice, and guacamole with your choice of add-ons and tortillas make it the perfect choice. Make sure you avoid the tortilla chips if you are vegan. They are fried with the fish. That may not matter to some but it would make them not vegan unless you prefer fish proteins swimming on your chips. So, the next time you are in the mood for a burrito you can drive right through the burrrito forest to the only one that does it right, Baja Burrito.